I wear a 7.5W, and finding good shoes is an adventure. I was torn between these and a couple other Merrell and Keen models, but I finally chose this one on the ratio of good reviews to bad. I fully expected to have to go to a size 9 on these, but the width worked well, and I don’t feel any strange rubbings internally, as noted by some other reviewers. These are very firm, out of the box, and in my (minimal) breaking in period, I can tell that they will protect my feet during light and medium hiking. I have gotten my feet wet a bit, and haven’t noticed any soak through, but I wouldn’t ford a stream in these unless I was being chased. I hope, being Merrells, these will perform reasonably well under normal wear and tear, but I’ll update if not. These are very low on my ankle (good for me) but you can’t quite tell that from the picture. If you need ankle support, these are not the shoes for you. I paired these with Lorpan Ultralite socks and they fit well. I am excited that they don’t dig into my heels like my Keens or Altras do during break in. 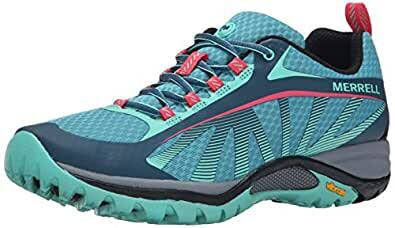 Merrell Women’s Siren Edge Hiking Boot, Faience, 8.5 M US So I was a little concerned about buying these shoes because of some of the negative reviews. I’d been shopping for a pair of hiking or approach shoes for several months. I really wanted a lightweight shoe that I could use for trail running in a pinch. When I found these shoes, they had all of the featured I was looking for and I didn’t have any excuse to not try them since, with Prime, there were free returns. I’ve had them for a few days and wore them walking around town for a full day. They are very comfortable and fit as expected. The toe box it roomy compared to my running shoes and they seem VERY WELL MADE despite what others have said. The arch support is really good and they have nice thick tread. I can’t really think of anything that I don’t like about these shoes. See all the pics to see quality. I bought these shoes for a trip to Ireland and wore them to hike down every path and over every rock for a week. They were equally good on uneven streets. They have great tread on the bottom and held on slippery surfaces and just enough cushion for comfort and conform to the foot well. They strike the right balance between sturdy and flexible which was so helpful on rocky surfaces. The colors are attractive and made it possible to wear them with a variety of outfits, since the design doesnât scream hiking boot. Most importantly, after miles a day not a single blister! I hesitated over price before I ordered but in this case, I definitely got what I paid for! I buy a pair of Merrells twice a year for work. I work 12 hour shifts where I’m on my feet most of the time and have dealt with Achilles tendonitis and plantar fasciitis in the past, so I’m picky about shoes. These were a bit larger in the toe box than most of my Merrells, but nothing I couldn’t get used to. My usual 8.5 fit right everywhere else. The color of these is so fun, very cute. I loved how grippy they were, they were perfect for the hospital floor. Sadly, after one shift in these, my plantar fasciitis was coming back, and my hips and knees were killing me. I can’t pin down where the problem is, but the arch support seems to be lacking compared to my others. Have to return them. I purchase the Merrell Siren Edge to wear on a 9-day trip to Scotland. I had previously bought a non-waterproof pair of Keens and was all set to wear them. However, the Merrells fit like a dream right out of the box and had a much nicer profile than the Keens. They were roomy in the toe box without looking so clunky and the sole was actually more cushioned than the Keens. They were also very lightweight. Sometimes shoes run short, but this sizing was spot on – a true 11M. My foot isn’t particularly wide and they fit well with moderately thick socks. This is an ideal shoe for walking on a variety of paved paths and trails (compacted dirt & small rocks). For significant mileage off trails, I would probably want a more stable hiking boot. I can’t praise these hiking shoes enough! I love Merrell but these are better than any other of their hiking shoes or boots I have. First of all they are light like a feather, yet sturdy enough to keep your foot stable. They are soft inside and don’t bother my toes. And last but not least, they look small and cute. I wear a size 9M and most of the shoes I buy look like big boats on my feet, but not Merrell. Merrell makes boots and shoes that make your feet look small, although they fit right. I would highly recommend these. These are my favorite of the hiking shoes I’ve ever bought. They are not as bulky and outdoorsy looking as the others – they are’t brown. They look more like a performance shoe and they worked out very well on a steep hike over rocks. They gripped very well and are very comfortable! very comfortable, light weight yet rugged. The bottoms have great traction and grip, did some really rocky, steep hiking and they handled it with ease. I had another pair of Merrell’s and the stitching and reinforced toe surround piece dug into the top of my foot when walking. These have a reinforced area but its very flexible and doesn’t dig in. there is a nice cushioned insert with arch support. Also the toe area was not wide, but allowed flexibility for the toes, isn’t tight or loose for my foot. I would say my feet are not wide, nor narrow. A narrow foot might end up with too much room at the toe.